North Korean leader Kim Jong Un's latest gift to the residents of Pyongyang, the renovated central zoo, is pulling in thousands of visitors a day with a slew of attractions ranging from such typical zoo fare as elephants, giraffes, penguins and monkeys to a high-tech natural history museum with displays showing the origins of the solar system and the evolution of life on Earth. But one of the most popular attractions might come as a surprise to foreign visitors. Just across from the hippopotamus pen and the reptile house, dozens of varieties of dogs — including schnauzers, German shepherds, Shih Tzus and Saint Bernards — are on display in the "dog pavilion." One, a King Charles spaniel, was presented as a gift to Kim's father, Kim Jong Il, by "the U.S. company Tapco" in 1995. According to plaques above their pens, which — dog lovers will be relieved to know — are spacious and clean, Kim Jong Un himself chipped in by giving the zoo its schnauzers, poodles, German shepherds and a Chihuahua. 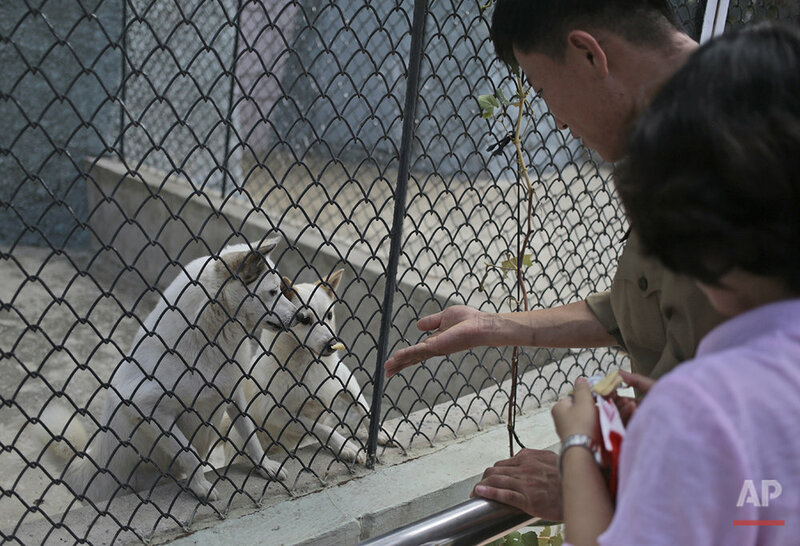 Former South Korean President Kim Dae-jung, who pursued a sort of detente with Pyongyang called the "Sunshine policy," presented the North with a Jindo dog that now resides in the zoo. North Korea's own national dog — yes, it has one, the puffy white Pung San breed — lives in a pen next to it. 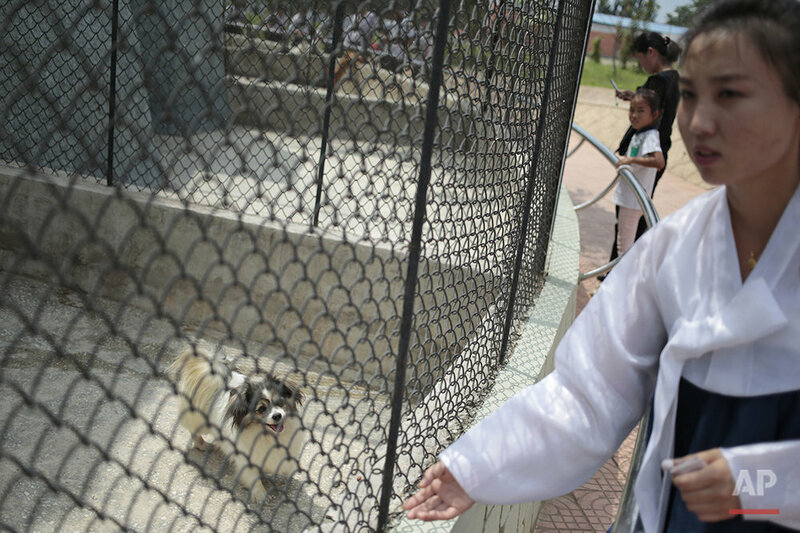 Though somewhat shocking to those accustomed to thinking of dogs as companions or household pets, the zoo display may actually reflect an increasingly fond attitude toward dogs in North Korea. While dog meat is still a common dish in the North, and in China and South Korea as well, a small but growing number of North Koreans are keeping canines as pets. People walking dogs on leashes can now be seen from time to time in Pyongyang and some other cities. And instead of suggesting recipes, signs in the dog pavilion describe the best way to train a pet dog, suggesting that patience and kindness work better than harsh words. Aside from the dogs, another unique feature of the zoo is the posting of signs above many of the animal habitats noting where the "gift animals" came from — which is intended to remind visitors of how much North Korea's leaders are loved and respected by leaders abroad. 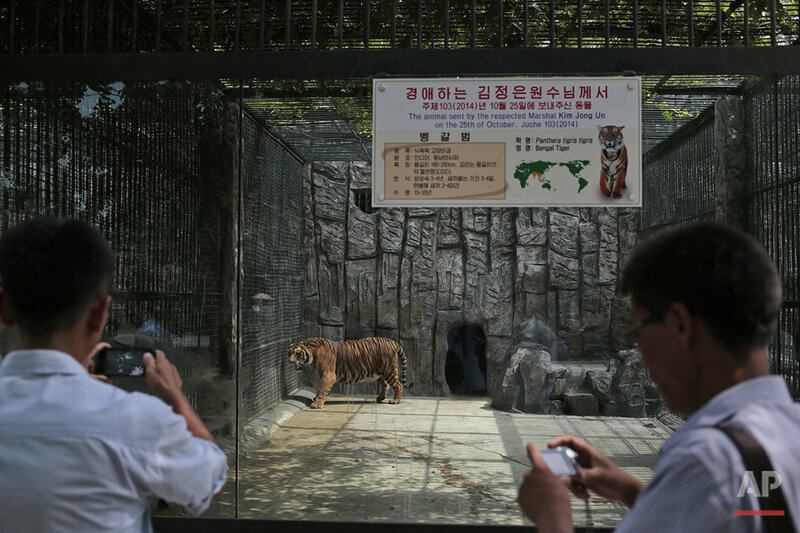 The signs also are meant to emphasize the benevolence of Kim Jong Un, who along with the dogs donated tigers, giraffes and many other animals at the zoo. Pyongyang's central zoo actually dates back to 1959, when Kim Il Sung, the nation's first leader and the grandfather of Kim Jong Un, ordered it built on the outskirts of the city. According to an official history, the zoo started off with only 50 badgers. That same year, however, it got its first "gift animals," elephants donated by fellow socialist leader Ho Chi Minh of Vietnam. Fittingly, the elephants, according to the zoo, were heroes in the socialist revolutionary movement because they helped the Vietnamese by carrying war materiel in the fight against French colonialism. Another "gift animal" elephant was donated by Laos. Zebras and ostriches at the zoo were donated to Kim Il Sung by the leader of Tanzania, and orangutans were donated by the late President Suharto of Indonesia. The mayor of the Japanese city of Kyoto gave the old zoo a jaguar. 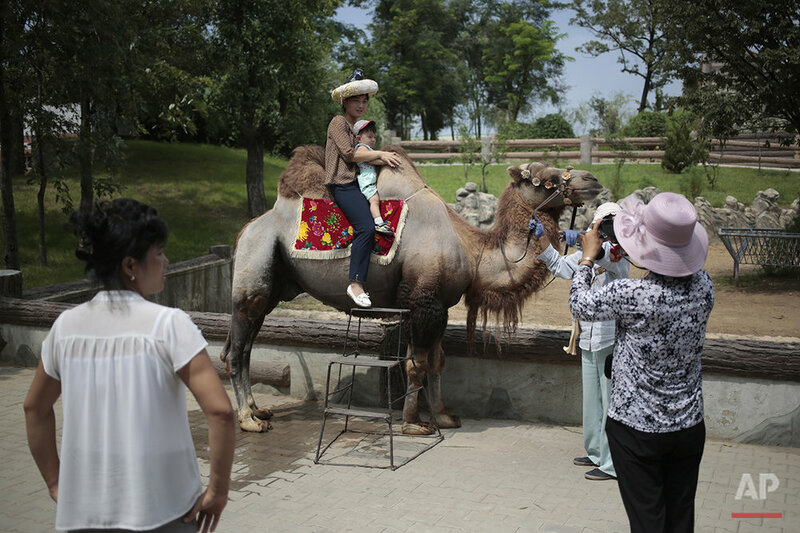 Renovations for the new zoo began in 2014 as part of Kim Jong Un's efforts to create more modern and impressive structures and leisure centers around the capital, including several major high-rise housing areas, an equestrian center, a sprawling new shooting range and a giant water park in the city's center. Though Pyongyang is far ahead of other North Korean cities, not to mention rural areas, in terms of development, there has been some growth elsewhere also, including the Masik Pass luxury sky resort near the port of Wonsan on the country's east coast. Text from the AP news story, Lions, Tigers and Poodles? 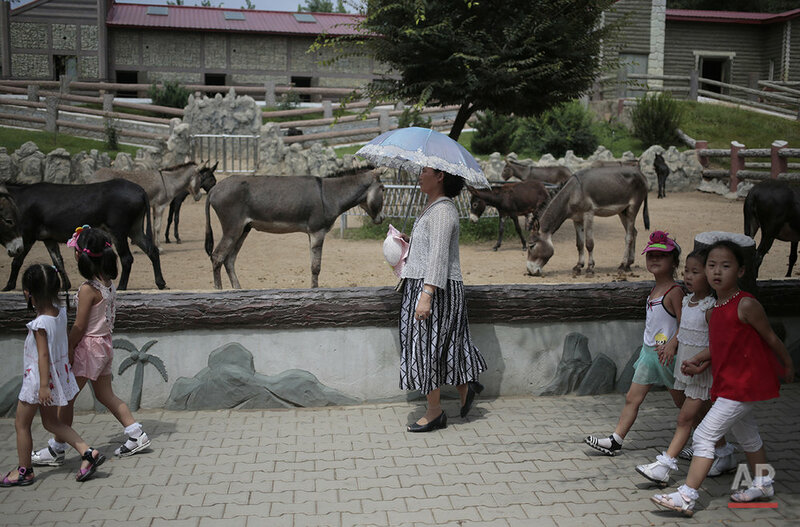 Dogs a Big Draw at Pyongyang Zoo, by Eric Talmadge.